There's one thing that I just haven't been able to get out of my mind since we got back from Clarens. This. And after dreaming and drooling about it non-stop for ten days straight, I decided that enough was enough. I just had to recreate it. 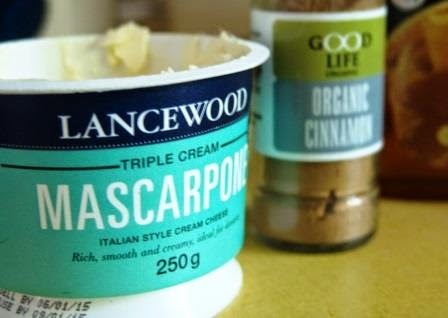 Cue an expedition of note to find a local store selling mascarpone cheese (Kimberley isn't exactly Foodie Mecca) and a replacement for berries (same reason, plus it's wildly expensive), and we were sorted. Ladies and gentlemen, I bring you Peachy French Toast. (Note that the jury is still out on it's health status, but I can promise you one thing: It's incredibly satisfying. The tartness of the peaches, the sweetness of the honey and the richness of the mascarpone were simply meant to go together. Comfort food at its finest.) Enjoy! Whisk the egg and soak the slice of bread in it for a minute on each side. Heat up a dab of coconut oil and, over medium-high heat, cook the bread coated with the egg mixture until golden brown. In a separate pan, heat up another dab of coconut oil. Add the peach, skin and pip removed and cut into small pieces. Add a squeeze of honey, a shake of cinnamon and a small pinch of salt. Cook until the peach pieces turn soft (approximately 4 to 5 minutes), stirring occasionally. Remove from the heat. 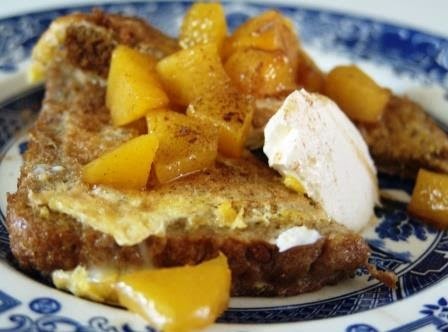 To serve, spoon the hot peach-mixture over the French toast and add a generous scoop of mascarpone. Dust with cinnamon. Mmmm. French toast trumps health status. Right? ;) Haha. Looks amazing! !